Im always up for adding new chickens. I'll check into it. I looking at new ways on how you get certain types of chickens. I'd love to see magical agriculture chickens like inferium? Would that be a possibility? Its possible, but because our mods are some what a like. as far as resource gathering. I have decided to not add this mod. I appreciate the suggestion. I'm doing this out of courtesy. First off great mod but I think the energetic and vibrant alloy chickens have their colors mixed up. Hello! Would you be able to tell me what the chickens entity name is? Trying to add these chickens to a blacklist to not be allowed in some spawners. minecraft:chicken doesn't seem to work. Use MPutils to help ya with that stuff: There is a Command "/mp lookingat". That will help you with those things. 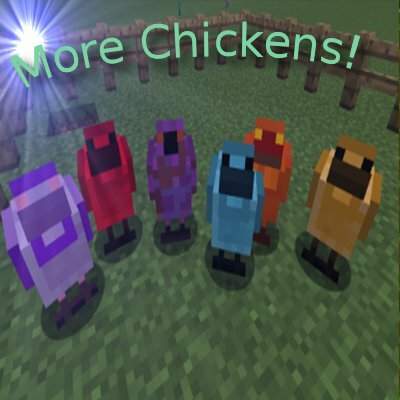 I just added it to my game and I'm not getting any of the new chickens added by the mod. Do I need to go in to new chunks or what. Where are a Draconium Chickens spawning ? I was looking for they for 2 hours and I dont found them. Don't you have to breed other chickens in order to get them? It may depend on what pack you playing with this mod on. By default chickens are breed to get the awakened draconium. But pack devs change things to better suit their pack. If your playing a pack you need to ask the pack dev instead. Always got to them first. But I dont play on any pack. I just created my own private pack and dont change anything. you can only breed to get those chickens they don't spawn.The only chickens that spawn are tier 1 chickens. All other tiers are gotten by breeding mechanics. Edit: also check your configs.. you may need to edit your configs some. As one of the chickens needed to breed isn't turned or didn't load. Some editing is required because of all the mods that link up.